NEEMO 16 aquanauts Dottie Metcalf-Lindenburger and Tim Peake chat with NASA administrator Charlie Bolden while outside Aquarius undersea research station on June 20, 2012. The ocean floor may seem a bit close to home for astronauts on a mission, but the underwater world provides a great dress rehearsal for a trek to an asteroid in deep space, two spaceflyers told NASA chief Charles Bolden today (June 20). Bolden checked in with astronauts Dottie Metcalf-Lindenburger of NASA and Tim Peake of the European Space Agency as the pair floated outside the Aquarius research station, about 62 feet (19 meters) deep a few miles off the coast of Key Largo, Fla.
Metcalf-Lindenburger and Peake are two of the four crewmembers on the 16th expedition of the NASA Extreme Environment Mission Operations program, or NEEMO. The main goal of NEEMO 16, which began June 11 and wraps up Friday (June 22), is to help NASA prepare for a manned mission to a near-Earth asteroid. This is a key priority for the space agency. Two years ago, President Barack Obama directed NASA to work toward getting astronauts to a space rock by 2025, then on to the vicinity of Mars by the mid-2030s. "It's been an incredibly realistic mission, yes, absolutely," Peake replied, as colorful reef fish swam around him and Metcalf-Lindenburger. "I don't think you can beat Aquarius, and what we've been doing down here, as far as a space analogue is concerned." The NEEMO 16 aquanauts' activities focus on three core areas, NASA officials have said: dealing with communication delays, figuring out optimum crew sizes and coming up with ways to attach to and travel across an asteroid in deep space. They've tested out asteroid-snagging tether systems on seabed "spacewalks," for example, with the underwater environment providing a decent approximation of what it would be like to work in space. And NEEMO 16 crewmember Steve Squyres — a professor at Cornell University and the lead scientist for NASA's Spirit and Opportunity Mars rovers — recently fastened his feet to a small submarine and was driven around from spot to spot, trying out a technique that could let astronauts explore an asteroid while keeping their hands free. All of this work has been extremely productive, Peake said. "We've had a fantastic mission. We've accomplished all of the objectives, and we've really collected a load of great data," he said. "I'm really looking forward to seeing the results of that data, and to seeing what the fruits of our labor will produce in the years to come." The fourth NEEMO 16 aquanaut is Japanese astronaut Kimiya Yui. He and Squyres sat inside Aquarius during today's phone call, staying as dry as Bolden did. 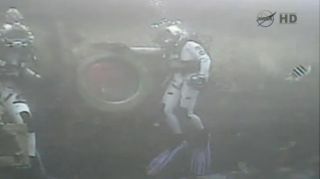 Metcalf-Lindenburger, who flew on the space shuttle Discovery's STS-131 mission in 2010, commands NEEMO 16. Aquarius is the world's only undersea research station, according to NASA officials. It's owned by the U.S. National Oceanic and Atmospheric Administration and managed by the University of North Carolina at Wilmington. The station sits on a patch of seafloor next to coral reefs in the Florida Keys National Marine Sanctuary, 3.5 miles (5.6 kilometers) from Key Largo.